Movie Review: Efficient Icelandic director, Baltasar Kormakur, returns to the cinematic recreations of dramatic real-life events after the accomplished “The Deep”, dated from two years ago. Right after the latter, he made an incursion into the fictional action-crime genre with the uninvolving “Two Guns”, starring Denzel Washington and Mark Wahlberg. 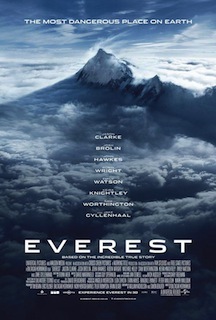 “Everest”, an account of the tragedy occurred in the Earth's highest mountain in the spring of 1996, also presents a strong cast, including Jason Clarke, Jake Gyllenhaal, Josh Brolin, John Hawkes, Keira Knightley, Robin Wright, and Emily Watson. Screenwriters William Nicholson and Simon Beaufoy try to assemble the different pieces in a mix of family drama, human competition, and survival epic, but in my eyes, and despite watchable, the film falls short of something big. A group of audacious climbers of several nationalities aims to reach the top of the Everest. The New Zealander Rob Hall (Clarke) and the American Scott Fischer (Gyllenhaal) are two experienced guides who, competing each other to get the attention of the media, will drive a group that features Beck Weathers (Brolin), who doesn’t seem so confident as the others and expose himself to some calamitous situations, Doug Hansen (Hawkes), who had failed the task before but wants to prove he can do it, and Yasuko Namba (Naoko Mori), who already had climbed six of the seven highest peaks. Halfway, all of them talk about their motivations to embark on the expedition, which is constantly monitored by Helen (Watson), the base camp manager, who keeps them informed about the weather conditions, via radio. With more or less difficulty, the glory is attained by most of the climbers, who had no idea of what would come next. A huge storm, bringing devastating chilly winds and blinding heavy snows, sweeps the mountain when all of them, except two, had initiated the descent. To pump up the anxiety, oxygen bottles are not available anymore and high-altitude pulmonary edema attacks mercilessly, leaving the most fragile freezingly motionless. The drama of the mountaineers’ wives is also a crucial point of Kormakur’s camera, which seeks the best vertiginous angles to provoke us a few shivers. All the same, “Everest” is more breathtaking than emotionally responsive, failing to mightily step onto the peak of the subgenre where it belongs.